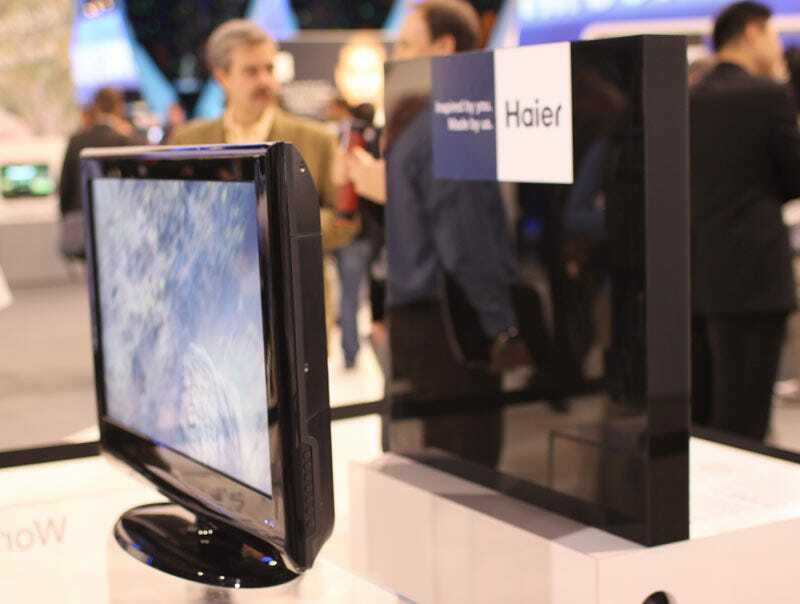 Wireless power has gone from lab prototype to working product in a little over 18 months, and Haier stuck MIT's WiTricity into a TV along with WHDI wireless video for complete wirelessness. Complete. Wireless. Ness. Sure, there's a big power unit on the wall, radiating (totally harmless) RF into the back of the TV, which has a coil inside to receive the juice. It only delivers full strength if it's parallel, so you have to plan ahead and somehow setup the TV in front of the wall that has the power module. Because of all the hocus pocus, the TV itself is a chunkster, and that power transmitter is no slim jim either. Still, the idea is a good one, and the promise—as both MIT and Intel work their asses off getting wireless power up to snuff—is real. WHDI is a lot further along in development. Wireless HDMI isn't exactly household, but the tech is now supported by basically all of the biggest CE companies except Panasonic. I'm not going to buy this Haier TV—it might not even be for sale this year—but it's a concrete sign of what's to come.